Super Bowl Sunday has become an unofficial holiday for millions of Americans to celebrate one of America’s favorite sport. For most, it is a chance to get together with family and friends and enjoy the simple pleasures of life, all the while rooting for their favorite team. This year’s Super Bowl was no different, except that one of the nation’s largest insurance companies decided to give a somber note in the middle of the festivities. 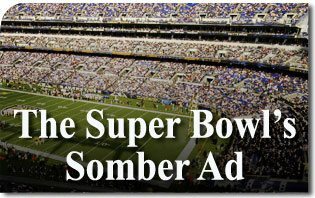 The Super Bowl, for better or worse, has become more famous for its television commercials than its touchdowns. This year, 34% of total airtime was taken up by the now celebrated advertisements. Most ads feature happy, smiling people or cute little puppies, all of which give an air of relaxation and enjoyment. However, Nationwide Insurance broke the consensus. Their now controversial commercial showed a little boy describing what he will not be in life. From riding a bike to getting married, he sadly states that he will never do any of these things because he was killed in an accident. According to Nationwide, the commercial was meant to raise awareness to the dangers children face each day in their homes and advertisements are meant to reach a large number of people as provided by the Super Bowl. The commercial was in no way graphic, nevertheless, it sparked a huge controversy with many viewers. Many people watch the Super Bowl to escape the trials and tribulations of daily life. In the midst of their entertainment, a sad reality descends upon them through a somber ad. The ad only intended to create awareness to the dangers young children face in life. There was no evil intended and no moral compromise made in the ad. What remains puzzling is why anyone would dislike an advertisement that promoted the good of our children by creating awareness to childhood deaths? Though it cannot be said that everyone who watched the Super Bowl reacted badly, the fact that a large number did, shows that many Americans are unwilling to see even a minute of a key aspect of reality especially while being entertained. Are we a nation that places entertainment above the sad and unfortunate realities of life? Should we not accept a somber ad reminding us that suffering is also part of life? This entry was posted in News Commentary and tagged children, Nationwide Insurance, Super Bowl by Luis Dufaur. Bookmark the permalink.